The members of this genus are commonly called mushrooms. Mushrooms grow on soil. They are abundantly found on soil with decry plant material and moisture. The specie ,4garietts campsites is very common. This species is edible. It is cult hated for commercial purposes. Vegetative mycelium: It is underground part of the mycelium.It is composed of simple filamentous hyphae.The cells of the mycelium are uninucleate at first.Later two hyphae fuse with each other.The mycelium thus becomes dikaryotic.The mycelium develops rhizomorphs.Sporophores develop on rhizomorphs. (a) Primary gills: The gills Nshich run through the whole length of the pilaus flout stipe to margin of pilaus are called primary gill. The stipe has ring like structure below pileus. 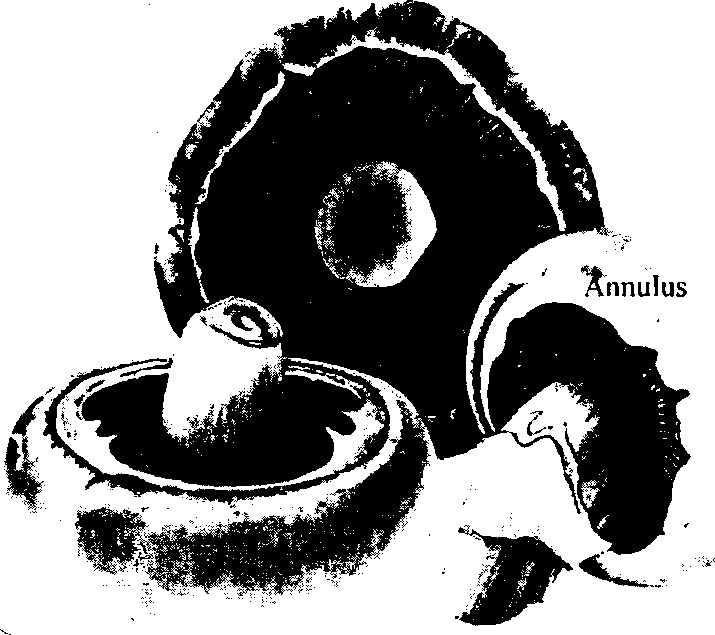 It is called annulus. The stalk and upper surface of pileus has white colour. But the lower surface is black in colour. Asexual reproduction is rare in Agarkus. It may occur in some species by chlamydospores formation. 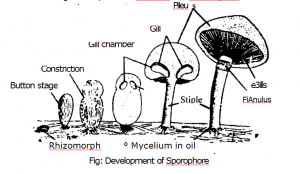 Sporophore is the reproductive structure. 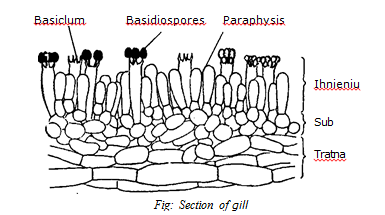 The gills of sporophore have following structure. I. Tram: The central part of gill is called trama. The hyphae are compact in the trama. These hyphae are arranged longitudinally to tin long axis of gills. compactly to form hymenium. Hymenium are present on both surfaces of the gills. Inner layer of hymenium is called sub­ktmenium. Hyphae radiate outwards to form sub-hymenial layer on both sides. The tips of this layer develop basidia. Each basidium develops 2-4 sterigmata. Basidiospores are borne on st?rigniata. 3. P traphyses: Some basidia like structure are present between knelthim. These structures are called paraphyses. For nation of basidiospores: The cells which give rise to basidia are nultinucleate. But they become binucleate by the disintegration of cther nuclei. The two nuclei fuse to form zygote nucleus. The zygote nucleus undergoes meiosis. It forms four haploid nuclei. Stertgmata are produced at the tip of basidium. Sterigmata develop basidiospores at the tip of sterigmata. 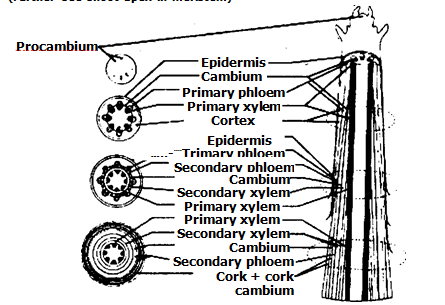 Each nucleus migrates into the each spore. Some species form two but some forms four basiliospores. The nucleus of basidiospore divides mitotically. Thus basiliospores are multinucleate. 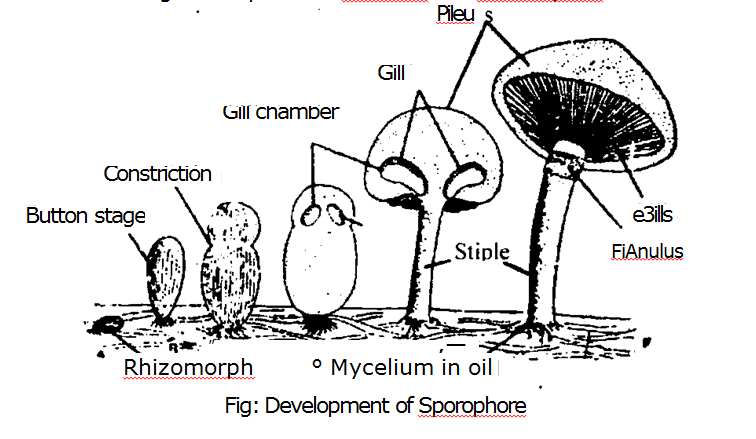 Mature spores are oval. They are dark in colour. It makes the gill black in colour. Basidiospores are disc’iarged from the sterigmata. 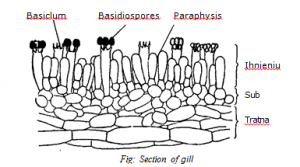 Germination of basidiospores: The spores germinate to produce mycelium in the soil. Mycelium grows continuously in favourable conditions for several years. The hyphae fuse at some points and exct ange nuclei. The hyphae are septate. Its cells are multinucleate. The hyphae may be free from each other. Sometimes, these hyphae join to form rope like structure called rhizomorphs. The strands of rhizomorphs grow at their tips. Some hyphae of rhizomorphs become much larger by the fusion of smaller hyphae. Some peripheral branches develop sporophore. The sporophores develop rings called fairy ring. Many primordia of sporophores develop on the rhizomorphs. These primordia are called buttons. Only some of them become mature sporophores. Tie diameter of young sporophore becomes 1-2 mm. A transverse internal ring is formed in the sporophore. This ring is composed of vertical hyphae. This ring form hymenial primordium. The portion o:’ sporophore above the primordium form pileus. The portion be low the primordium forms stalk. A cavity is produced below the hymenial primordium. This cavity is called prelamellar chamber. T e hymenial primordium becomes concave. Fast and slower growing hyphae are produced at its lower face. These hyphae become gills. The upper portion of sporophore rapidly increases in diameter. It increases the interlamellar space. New gill pritnordia are produced. These primordia form secondary gills. The button grows rapidly. Its cells increase in size. A sheet of’ tesues velum closes the lower side of the prelamellar chamber. Velum unites the young pileus with the stipe. The pileus expands. T’terefore, velum ruptures. But some portion of velum remains attached to the stipe. It forms a ring called annulus. Rupturing of vtlum exposed the gills on the lower surface of pileus.